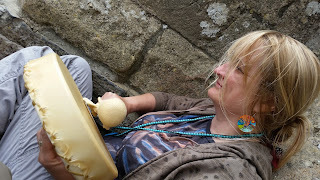 Learning more about ourselves and connecting with each other as we learn more about these ancient ways of drumming our hearts own beat and finding our hearts own song. As a keeper of Many Drums (name of our truck!) 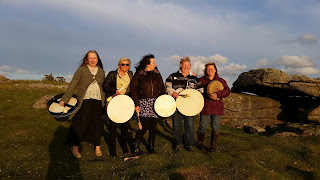 Lorna brings 20+ drums to Wales. Some are genuine Native American drums and some Celtic drums to honour our ancestors. As a songkeeper and song weaver Lorna can help you find your hearts own song. This workshop can include a medicine bag making session if the group wishes to use the time that way. To include materials for a medicine bag to carry your song home. Lorna has worked with song and personal song writing for many years, at kids camps, in Learning Disabilities and Dementia services, in womens groups and gay mens workshops. Since 2011 she has been an apprentice to Sandy Leo Laframboise a Native American Elder in Vancouver Canada. Lorna travels out to regularly to work with Sandy in apprenticeship and in ceremony on the Reservation lands. We do not charge for our time-this is a fundraising workshop to bring Sandy and supporter Three Medicine Horse to Wales later this year. Cost £60 Please bring your lunch - we will bring tea, coffee and yummy cakes!